Polycab FR Building Wires are insulated with a fire retardant (FR) pvc compound , specially formulated by one of the our group companies to provide added safely . this FR PVC compound has a high oxygen temperature index. These properties help in restricting yhe spread of fireeven at very high temperatures. Backed by a rich industrial experience, we have come up with a world class assortment of KEI HT Cable. Backed by a rich industrial experience, we are engaged in offering a commendable array of HT XLPE Cable. Owing to our superiority and customer oriented approach, we have been in presenting optimum class HT Cable. POLYCAB is one of the largest manufacturers of variety of cables and an established name in India as well as abroad. 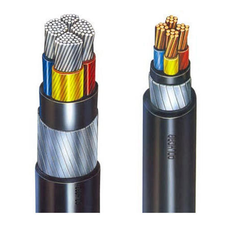 Polycab Wires and Cables are most preferred with numerous instillations throughout the country. The range of products includes Power Cables, HT XLPE, LT XLPE and PVC Cables, House wires and Flexibles. X Ray Non touch sensors of Sikora make for thickness and dimensional control. This system continuously measures the dimensions of insulated cores. Unit has capability to measure multilayer dimensions in all directions.